So. I mentioned feeding the turkeys and geese some cabbage yesterday. I figured I should show you them, too. 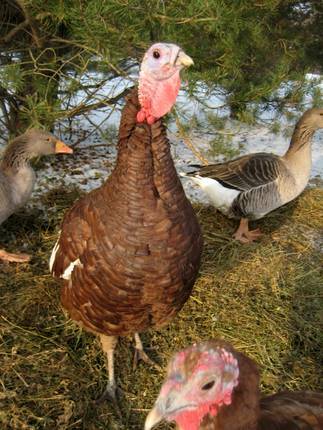 Tom has started calling our tom turkey Travis. I’m not in love with the name, though. That’s the hen in the front: she’s impossible to take a clean picture of because she loves to peck at the camera. We got them as babies at the end of June from Privett Hatchery. 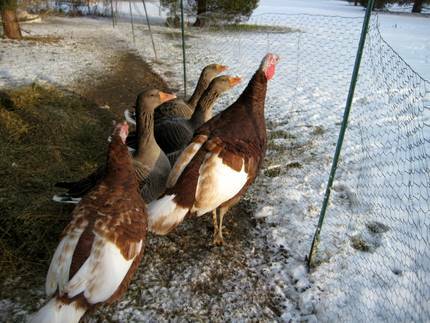 The geese are production Toulouse and the turkeys are Bourbon Reds. I ADORE them: they make life on the farm so very fun. Since Day One, they’ve been friendly and people-focused: you have to train baby chicks to like you, so having these six little instantly amenable puffballs of fluff was quite a surprise. The turkeys bonded with the much-larger geese and the geese bonded with our much-larger daughter. We’d let them out in the grass and they would follow her, running, flapping, after her as she’d tear off, giggling. We would do our nightly play sessions with them after dinner all summer and fall. It was like having six feathered dogs following us about the property in the evening. Six, and now five. One turkey, a girl, was the highlight of our Thanksgiving feast. Heirloom turkey is quite different than your average Butterball bird. It’s really tasty, for one; the meat is darker, and very juicy. Another difference is there isn’t a lot of meat. Bourbon Reds are medium-sized birds, and our birds can fly, and do. (You won’t see even a half-grown broad-breasted production bird fly.) So we didn’t have a lot of leftovers, which, frankly, was fine by me. Turkey can get tiresome. It took about forever for the turkeys to get large enough that I could discern if I had boys or girls or both. The geese took lots less time, but that’s mainly because they matured so much more quickly, not because the job of sexing them is easy! Toulouse geese and ganders look a lot alike, so you have to look for more subtle clues: the boys, for example, have more prominent eyebrow ridges, and are more aggressive with strangers and dogs. I had one tom turkey and two hens, and I have one goose and two ganders. The three boys out front, yelling at the dog. The two girls are hanging back but are also giving the dog a piece of their mind. Got some food for us? 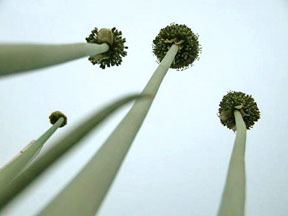 It’s seamless, sort of like a Mobius strip, when you can grow the food for the food you grow. They are beautiful! Makes me want some too. I’m afraid the geese would float down the canal, we see some on occasion. Actually we had 6 for several years that floated down, got out and lived with us. Do you put out water for them? Linda, yeah, I schlep about 7 gallons of water a day out to them, some for their water container and about 5 gallons for the geese to swim in. As long as geese can get their heads and feet wet, they are happy. They have a kiddie pool for the warm weather, but now they just have to deal with a large flexible rubber feed bowl to do their daily ablutions. Spoiled birds. Do you know how heavy 7 gallons of water is to carry 200′? I have turkeys on my list for next year. 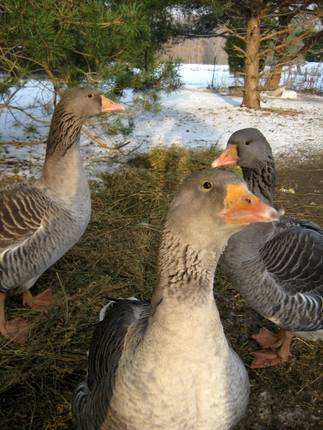 Hopefully, they will be acceptable to my twelve year old goose, who is the Queen. I’m so tempted to try chickens, but I fear I’m not ready for eventually killing and eating them. Except for my cats and an old dog, I’m not too crazy about animals. I’ve got other excuses too: coyotes, skunks, possums as neighbors. But mainly, I’m too squeamish. I envy your matter-of-fact treatment of your girls and boys. They’re quite photogenic. I grow extra kale and other greens for my chickens since they’re only allowed to roam the garden in winter. I love your geese – they are beautiful. I am considering geese for next year, but somebody told me that the snapping turtles that sometimes are in the pond will eat the goslings. Do you think that’s true? We butchered our first turkey this year. I thought I would be OK but as it turned out, I couldn’t eat any of it, so I had a vegetarian Thanksgiving dinner. I’m not normally a vegetarian. So now I don’t know what I will do about butchering the roosters that had been earmarked for freezer camp. Oh dear. I envy your sensible attitude about it. Your geese are lovely birds. Do you get eggs from them? Geez, I love your birds!! 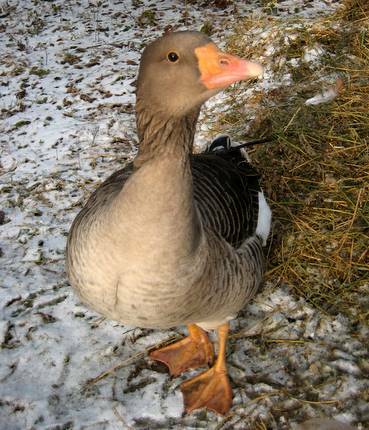 I used to have 2 Toulouse geese but they were pretty aggressive & would scare the bejeezus out of me when I ventured out into the yard. Yours seem to have much more personality, or is that just the camera lens angle?? Pamela, you’ve let out the one thing I haven’t told my husband about geese: their long lives! Is the Queen a solo goose? Our baby geese didn’t mind the baby turkeys sleeping on their backs. They seem to feel a strong need to bond (impress) upon someone. Maybe they’ll be so cute they’ll melt her heart? Well, WS, I had never intended to eat our birds when we got them 3 years ago too. The egg birds are kind of different. Because they’re so susceptible to predation, you would be quite surprised how very protective you become of them. Three birds are probably plenty, but you do need more than one. Neighbors can be bought off by eggs and you would love what you can do with their other product: poop. And they’re great recyclers of kitchen scraps. Claire, absolutely, snapping turtles think all waterfowl is a floating snack bar. The good thing is the geese don’t really need access to a pond. A small kiddie pool is fine. Really, they’ve been bred to be barnyard birds. They’d love a pond but you’d need to assess the risks. As for the turkey, well, it’s taken me a few animals before I can really enjoy it. I think it is completely natural of you to feel this way. Roosters, though, might not be so tough for you. What helped me is the first blobby batch of meat birds that I got really had no redeeming chicken habits like scratching or perching or whatever: they just wanted to eat. Not that I liked them less because of this but they were different ENOUGH that I had no problem with it. Our turkey, though? Well, that was hard, but I had two days to cool off before I put her in the oven. Candace, I hope to get eggs from her next spring. This type of geese lays something like 60 eggs a year. I am hoping of course she actually raises a few too: wouldn’t that be fun? I had a bit of trouble too with the turkeys. For some reason I find the way turkeys smell to be a bit offensive. It took me about a month from culling to cooking. So, you finally sexed them, ‘eh? Two females?! I’m jealous. So…what are your plans for your remaining two? Are you hoping to breed this spring? Hiya Ang. I didn’t think our girl smelled too bad, but that’s because guineas smell worse! (I also dry plucked; that seemed to be a lot less tiresome/smelly/cold.) Yep, I hope to breed these two. They’re still kind of babies yet so we’ll see how it goes. I’m not counting my turkeys before they’re hatched, but…it sure would be nice to be self-sustaining here! She is my only goose. Like yours, she is remarkably gentle, so I have no fear that she will be a danger to new peeps; I just don’t want her to be stressed by the addition. Seeing them grow, growing food for them, just the whole cycle is so satisfying I’m sure. I had no idea that they could have such personalities and be gentled. Your blog is wonderful for learning all kinds of aspects of local living and the world around you. Love hearing about the geese and turkeys, El. It looks like great fun. Can I move in with you?